Photographs are great for keeping a record of what’s happening on our lovely river – but somehow paintings capture more of the spirit of an event that even the best photograph in my view. And particularly when someone with real talent paints it. 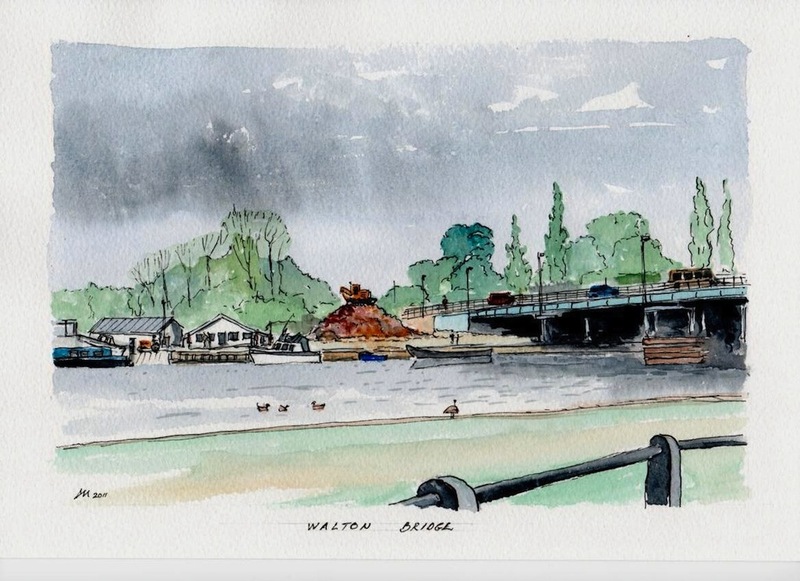 Regular readers of this column may remember that I have written before about local artist Doug Myers from Weybridge who embarked on a marathon project by putting down on canvas every single bridge on the Thames in oils and acrylics. That included bridges from the river’s source in Gloucestershire right down to the Queen Elizabeth II Bridge at Dartford – a feat that took him several years to complete. And having finished that marathon, he did contemplate starting a similar project painting all the bridges that cross the Wey between Weybridge and Guildford but he had second thoughts. “I did think about doing that but then I decided I needed a different challenge,” he told me. Well, if this first effort is anything to go by, I think Doug is learning pretty quickly. I particularly like the image of the excavator perched triumphantly atop a pile of bricks and rubble where the derelict riverside offices used to stand beside the existing bridge. Doug reckons he’ll be producing a picture a week between now and when the work is complete – so I’ll try to persuade him to let me publish an occasional update, which will eventually form a unique record as the new bridge takes shape. MY good friend Alan Woolford from Desborough Sailing Club tells me that the police have recently established a new initiative called Countrywatch – a kind of neighbourhood watch idea designed to reduce the number of thefts from farms in our area. Given that Desborough recently suffered the theft of an outboard from the back of a boat in their car park, this is clearly not a moment too soon. Keep your eyes open and if you see anyone acting suspiciously around boats or boatyards, call the police.